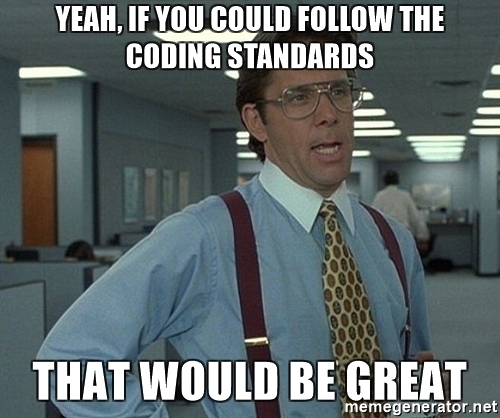 In 42mate we are very strict to follow the coding standards of the products that we use, so for example Drupal has a coding standard, Laravel uses the PSR standards, since we work in different kind of projects sometimes we get confused about the CS of the projects and we need something to help us to ensure the coding styles. In Drupal projects we use the Coder module that will check the sources for style errors, however, for Laravel projects we use Code Sniffer, this is a lint tool for PHP projects. 131 | ERROR | [x] TRUE, FALSE and NULL must be lowercase; expected "true" but found "TRUE"
132 | ERROR | [x] TRUE, FALSE and NULL must be lowercase; expected "null" but found "NULL"
You can hook this command on git to trigger this automatically and deny the commit if there is some code style errors. You can also add this tool in your CI job to mark the integration with errors if there is style errors. Also it is possible to fix this errors automatically with phpcbf, I’m not a fan of this automatic tools, however if you like it take a look to the help.